Natural Gas demand in the Caribbean is growing. Yet natural gas supply has not caught up to this demand. There are structural inefficiencies in the market that have prevented demand from being fully met. These inefficiencies represent a market opportunity. This article seeks to identify the underlying reason for the lack of natural gas supply as well as some recent developments to address this problem. Turning Natural Gas (NG) into Liquified Natural Gas (LNG) is the primary method for international transportation of this commodity. The advantage of condensing natural gas is that the liquefied state occupies 1/600 of the volume of the gaseous state. Within the United States and Canada, where there is a broad network of pipelines that transport fuels across the country, natural gas can be easily moved from where it is produced to where it is consumed without worrying about volume. For international demand however, installing pipelines through the ocean is economically unfeasible. NG is transformed into LNG, piped into large ships, and transported to serve international demand. This solution satisfies our large-scale distribution requirements. However, smaller scale demand to regions like the Caribbean remains unmet. LNG exports from the United States to Asia, Europe, and have seen incredible growth in recent years. Based on figures published by the EIA, exports to Asia grew seven-fold from 2016 to 2017 and exports to Europe grew five-fold over the same period. The majority of new LNG shipping vessels are of 120,000–140,000 m3 (4,200,000–4,900,000 cu ft), smaller size vessels are not cheaper or easier to fuel, therefore the small shipments are actually more expensive per MMbtu. Demand is made up of many, small, independent market participants. These dynamics make for reduced buying power and efficiency losses. Efficiency is crucial for a transportation process that is so complex and sensitive to costs. Some of the participants do not have the credit ratings required to land favorable interest rates. Large contract volumes and contract lengths with take-or-pay conditions create large risk burdens. Vessel and terminal availability is limited. The current infrastructure is operating at capacity. While commissioning a new ship has to be done up to two years in advance and building new terminals is expensive. Nonetheless, yesterday’s problems may not be tomorrow’s problems. As in any open market, whenever there is an unfulfilled demand, forward-thinking and innovative organizations will figure out how to create more supply. In the case of the Caribbean LNG market, many major energy players are currently looking to invest in the infrastructure needed to increase supply. Wärtsilä, traditionally a Finnish engine and power plant manufacturer, has recently entered the LNG market in the Caribbean looking to facilitate the many stages of distribution. AES is finishing its second LNG storage facility in the Dominican Republic. New terminals are being constructed in Florida by Eagle LNG Partners, while SPEC LNG has built a terminal in Colombia. These terminals can service smaller vessels and expand the shipping capacity of the entire region. Not only is the infrastructure improving, but other financial barriers may also be improving. Ryan Lawrence, VP of Shell NA LNG, noted at a recent conference that the length and volume of LNG contracts is beginning to decrease. Lawrence presented figures that showed that the length of contracts has already decreased by almost 50% from 2014 to 2017. Credit rating requirements have also loosened up in the last two years. This is significant. 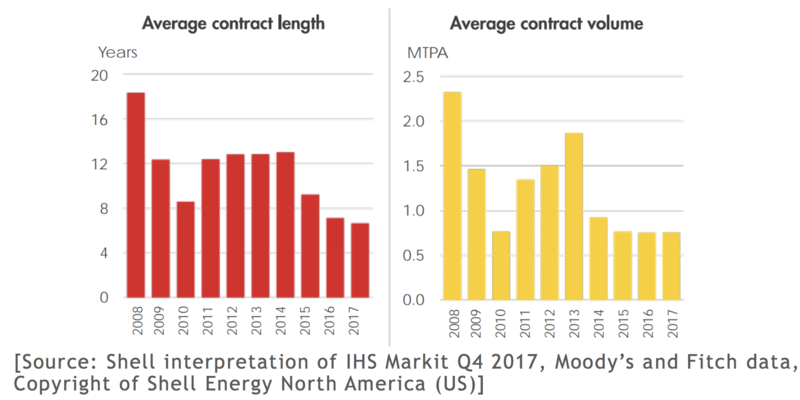 In the past, only market players with great credit and deep pockets were able to procure LNG contracts that typically spanned twelve or more years and involved large volumes. These developments indicate that barriers to market entry are decreasing on both the supply and demand sides, allowing smaller players to enter the LNG market. LNG is coming of age in the Caribbean for the same reasons as throughout the rest of the world. Natural gas burns cleaner than other fossil fuels, thereby pleasing environmentally concerned citizens. Natural Gas is also a better fuel in terms of energy density. At a price of $2.75/MMBtu natural gas produces 365,760 btu of energy, while oil at a price of $74.80/Barrel produces 77,537 btu of energy. The growth of renewable energy is also increasing natural gas demand. Although, many communities hope to be 100% renewable, the intermittent nature of these energy sources requires that grid operators have quick starting, fast ramping, resources to turn on as the sun sets or wind falters. Often, these flexible generation resources are fueled with natural gas. 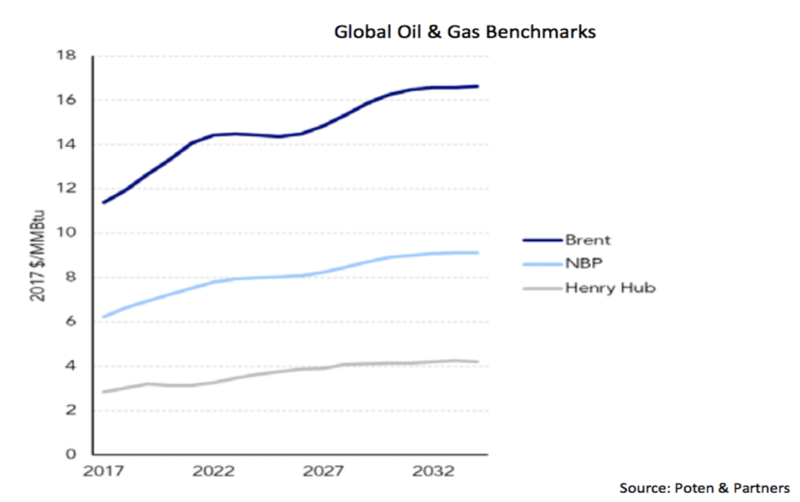 Looking at the graph below, Brent crude oil is projected to go from around $12/MMBtu to $16.25/MMBtu over the next 15 years. During that same time period they estimate that the price of natural gas will go from around $3/MMBtu to $4.10/MMBtu. This makes LNG a more economic option for electricity generation, assuming the required infrastructure is in-place. Does this mean that all thermal asset owners should start investing to convert their assets to run on natural gas? Should new assets be built to be dual fuel from the get go? The price graph below may make it seem like adapting an asset is a sure bet, but asset owners should carefully consider risk around price projections. What happens if there is another “polar vortex”, like the severe winter storm of 2014, or if snows in Texas again, like it did in 2017? 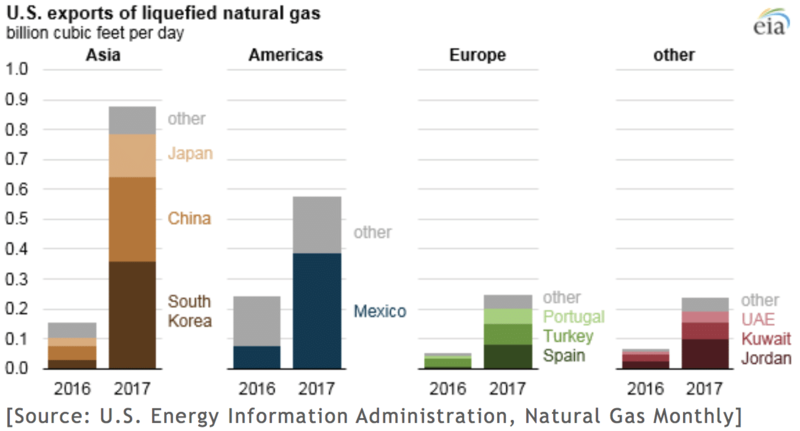 Since the price of natural gas is firmly tied to demand in the United States, events like these can cause spikes in the price of natural gas that could easily make LNG unaffordable. In the Caribbean, being mindful of risk around LNG investments will be important. This region is just now seeing the economics turn in their favor, but there are many sources of risk and the margins are still slim. To properly simulate risk, gas prices need to be simulated stochastically. Unlike deterministic models, stochastic models, don’t just evaluate one price path, or maybe a few scenarios. Instead, they give a distribution of prices that capture a large range of market conditions. This will allow those looking to invest to consider returns even in the worst-case scenario. Furthermore, having a stochastic price simulation model can lead to better contracting strategies that hedge against price swings. In short there no business decision will be truly sound unless there is consideration for volatility and uncertainty in commodity prices. The viability of a robust LNG market comes down to economics. It seems that the economics favor LNG demand growth over the long-term. Small-scale LNG in the Caribbean is starting to take off as well. This cleaner burning fuel is being paired with a new wave of renewable energy and storage. The result could be a more cost-effective, reliable, environmentally friendly, electricity grid. As the present infrastructure issues are solved, the stage is set for LNG to become the fuel of choice in the Caribbean. Although, there are many new opportunities in the LNG market, those that may be considering those opportunities should make sure to do careful, risk aware, analysis first. Sebastian Kadamany is the Manager of Latin America at cQuant.io, a SaaS energy analytics platform that helps companies understand their physical and financial exposure in today’s energy markets.